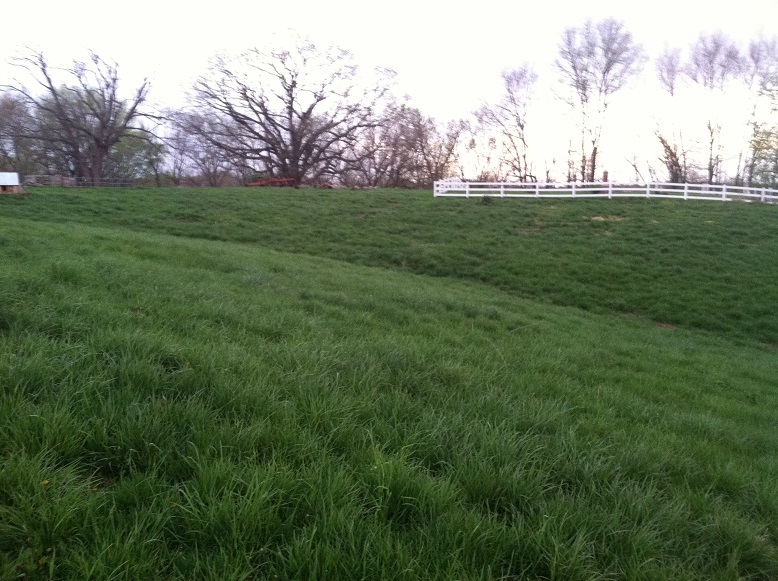 The pasture east of the yellow house should be some of our very best pasture. It’s up on the flat, it’s easy to access and it’s a good soil type. But it just doesn’t grow grass. What grows there is sparse and there is quite a bit of moss, especially on the north-facing slopes. I don’t mind a weedy mess but I do mind the bare spaces. And as I walk the field there are lots of bare spaces. Seven days from now the cows are scheduled to return here for calving. That’s the plan. But the forage didn’t read the plan. Fortunately the chickens did. 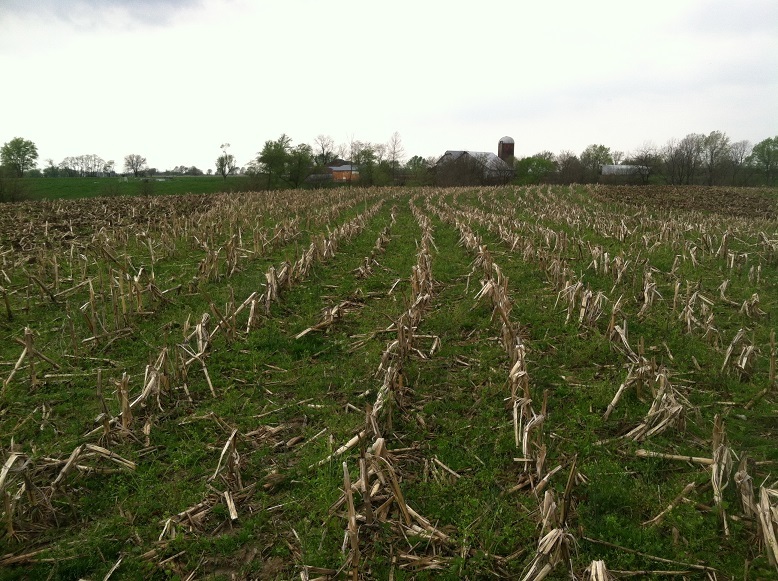 Where chicken tractors covered the ground there are distinct stripes of darker green and taller forage. And, yes, I spend a lot of time comparing shades of the color green. So my theory is that the cows, over the years, have grazed this open ground in the cool of the morning then lounged and manured under the trees (mainly in the creek!) in the heat of the day…translocating the nutrients down hill (!!!) and leaving too little behind for the soil biology. One little pass with chicken manure woke the soil up in three narrow bands. It’s a difference of 4-6 inches of forage and a massive increase in leaf area and density. But it’s not just chickens that are capable of this magic. On a whim I put a load of horse manure in the pasture shortly after the cows crossed this ground 3 weeks ago. If anything it was even more magical. But if you need further evidence I don’t know what to say. The hills closer to our house have been grazed for the last few years by goats, chickens, pigs, turkeys and cows. I honestly can’t tell you that everything is better off for it because there are two places in particular that I didn’t manage the pigs well enough but I can tell you that you can see the difference in the variety, volume and density of forage grown over the entire season. Those grasses now wake up at least 10 days before the rest of the farm and grow fast. These grasses are a foot tall in spite of the fact they have been grazed by cattle and by the layer flock in the last 6 weeks…the layer flock that came out of the greenhouse and ate everything in sight. All this growth in spite of apparent abuse and it’s only April 30th! So I have to get the pasture east of the yellow house on an even footing. After the cows cross that field again in a few weeks I plan to come back through with the manure spreader and a couple of loads of composted hog bedding, though I would rather apply compost in June when we begin our forage slump. I also have several loads of cow manure my tenant left in the barn…and thank God. Beyond that, I need to make my layer flock more portable so I can put them to work scratching, working and helping add fertility over a greater area. And I have to put more birds in chicken tractors. What a difference they make! We could accomplish this feat with cattle alone but we can speed biological time by using multiple species while, also, building additional profit centers for our farm business. If there is a crash in the cattle market, pigs and chickens could carry us through. The book The Farming Ladder drives this home over and over. Mr. Henderson would add that we should raise wheat and corn(maize) to more fully diversify the farm. But, to stay on point with the post, he would seek to heavily stock the farm. The increase in sheep, pigs and chickens would allow the farm to carry more cattle. I think we have illustrated his point nicely. Hoo boy. Matron, who knows her beans, put up a picture of Jane in a blog post Monday. Jane is a good-looking cow. She is, apparently, not an easy keeper but she looks great. That is a testament to Matron’s abilities and to the condition of her soils…after years decades of management. I highly encourage you to take a look. My pastures haven’t been well managed. I still have a lot to learn about grazing. My herd genetics are not what we hope they someday will be. And it is still early in the season so the cows haven’t slicked out the way I hope they will. But some cows just don’t shed their coat well. And those are the ones that didn’t breed last year. But 111 is a fertile, short, fat tank and she is losing her winter coat. But beyond that, Matron always points out that if the cows are properly mineralized they won’t look shaggy…scruffy. I have a couple of cows that are nothing short of scruffy. I think I’m on the right track with our mineral program but I have a lot to learn and a lot of work to do. She really is the future of the herd. I try to look at every cow every day at least once. That’s easy since there are so few. But it’s not just a glance. I look for gut fill by standing at the cow’s left and looking at the gap between the last rib and the pelvis. If there’s a triangular depression there, the cow hasn’t had enough to eat. If it’s full (even slightly bulging) I have done my job. If it has expanded and looks inflated, we need to stop what we are doing and deal with bloat immediately. Short of suggesting you make sure the cows have access to something brown and dry when the pastures are growing fast I’m not going to spend any time on bloat today. I also walk around behind every cow. Every cow. Every day. How do things look back here? Round? Plump? Are the cows gaining weight from day to day? Are their rumps and tails covered in loose, wet manure? Some of them are. That early spring grass is pretty rich so I’m making it a real point to have a little dry grass hay available to them…even if they ignore it. The dairy cows are a little thin for my liking. The beef cows are a little hairy. Some are a little loose. They all get looked over every 12 hours as we move them. That really is the best part of my day. Just listening to the frogs, looking for snakes. 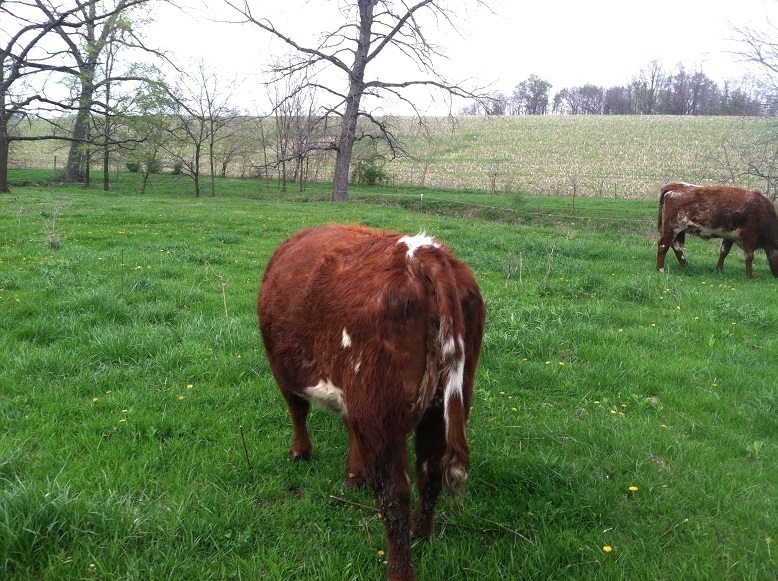 Listening to the quiet rhythm of the cows grazing; tongue, rip, breathe…tongue, rip, breathe. 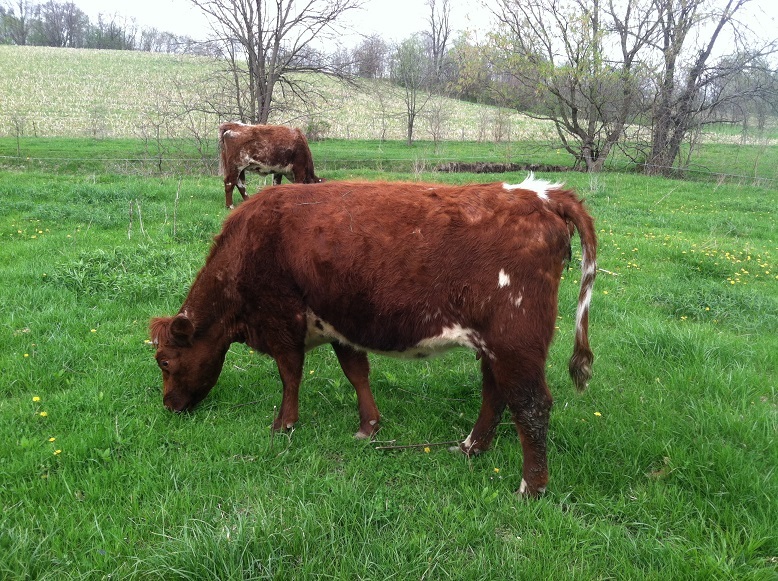 In the video above 41 came into fresh pasture with a full rumen but she went right to work. Cows will always eat a little more…cause if they don’t, another cow will. 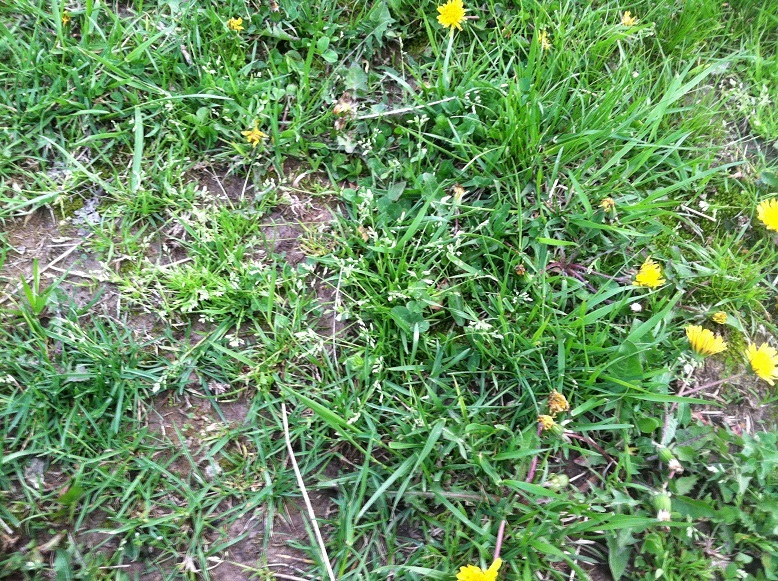 The grass is fairly dense here, mixed with young plantain and lots of dandelion but not much clover. It wasn’t long before they were all laying comfortably on the fresh ground taking naps and chewing cud. 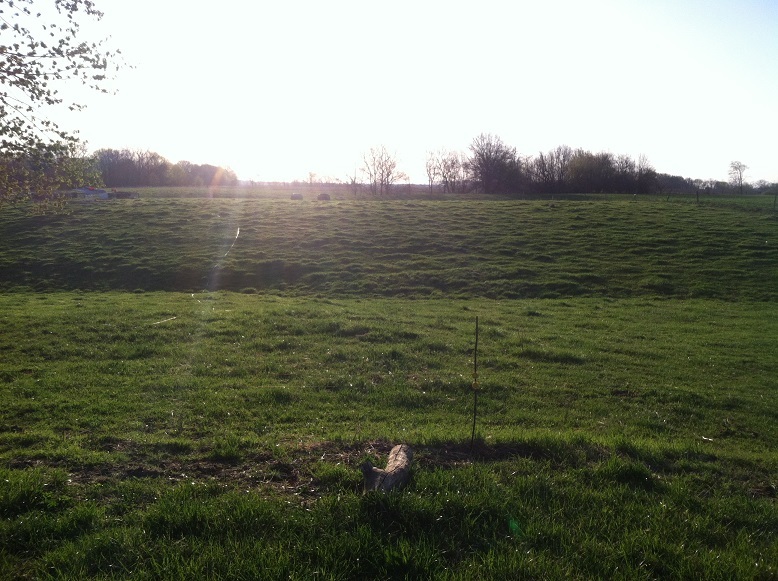 You can see a clear line between the morning’s grazing area and this new, fresh ground. That’s why we keep moving…and keep moving fast. 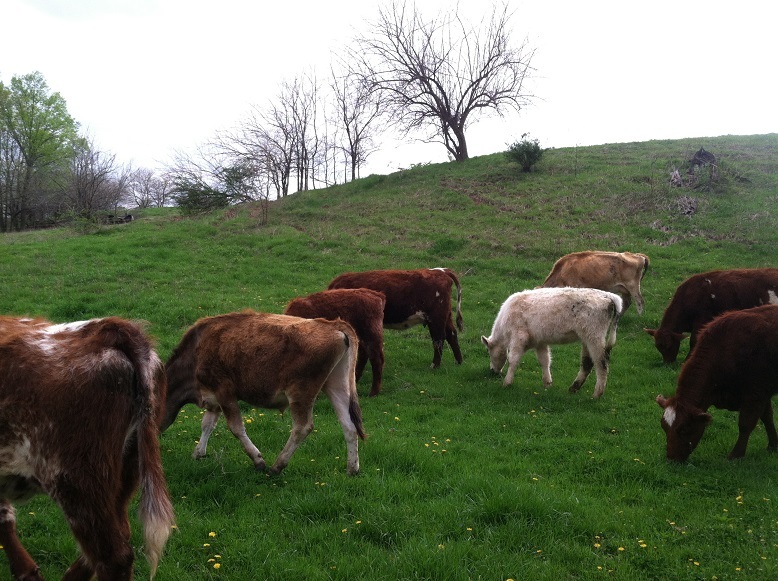 An acre a day…so fast I have a hard time keeping the mineral feeder fenced in with them. That rate would translate to 500 acres/day if I had 5,000 cows. I’ll have to figure something out before we get there…lol. I hope your grazing adventures are as fun as ours. Or if our grazing adventures are your grazing adventures, I hope I’m capturing it in a way that is helpful to your vicarious farming dream. It’s not all grass and manure. There is a lot of rolling up fence, pulling fence posts, pounding them back in and carrying heavy things around too. So if you are farming vicariously, go out in the rain and pick up something heavy. Be sure to splash a mud puddle in your boot so every other step sloshes. Dad and I got to play farmer Sunday. We aired up the tires on the old disc and pulled it out to the corn field to do some real farm work while dodging raindrops. We are in for a week of hard rains so it was important that we got this done…though it wasn’t on my list of chores for Sunday. 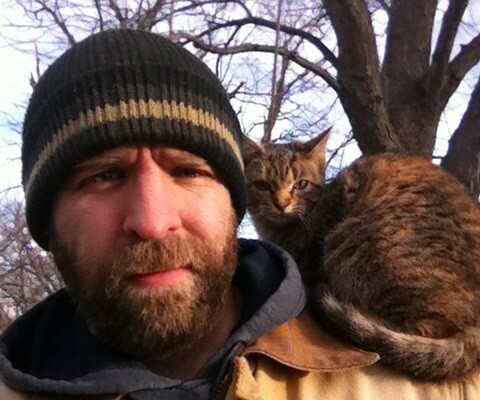 I was focused on cutting firewood and cleaning up around the farm. We are also plugging away at removing fences that have been stomped into the soil. Not easy work. So dad rode the tractor all day to plant 9 acres of pasture while the kids and I kept busy elsewhere. I may have also taken a nap at some point. Now, I feel that I have to justify ripping soil since I’m normally against it. First, this wasn’t my idea…it was all dad. But he’s not wrong. 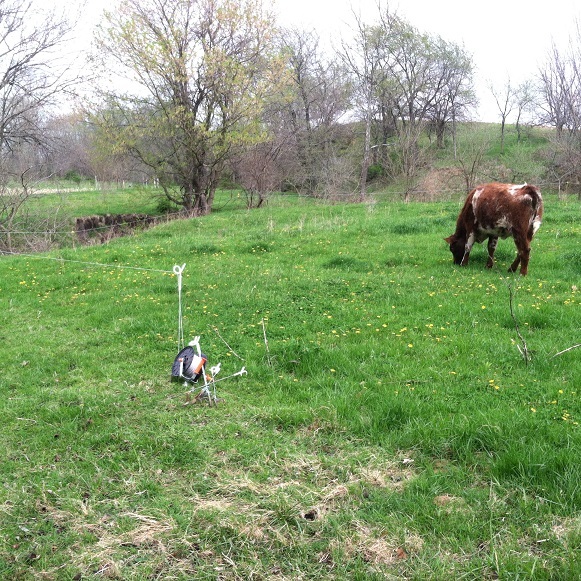 I have cows to cycle nutrients, shape the soil and spread seeds (speeding biological time). I have chickens to clean up behind the cows and speed up biological time. I have pigs to speed up biological time. We used the disc yesterday to speed up biological time. 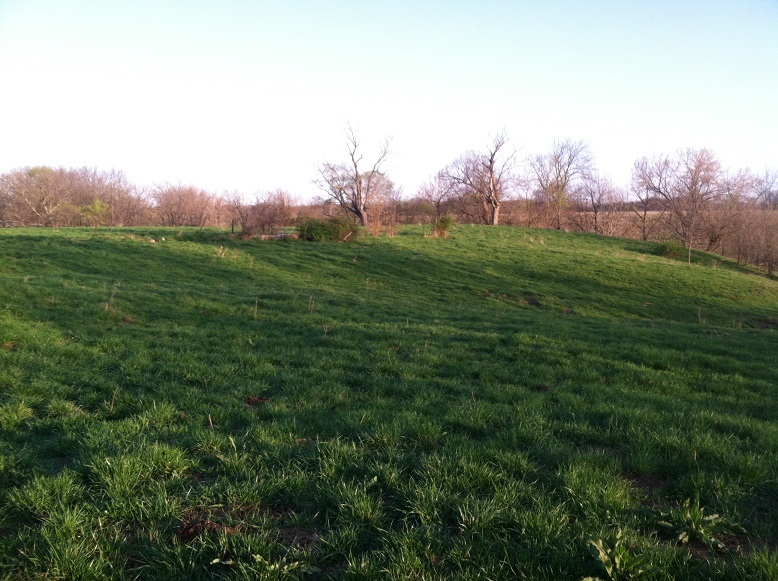 There is plenty of green growing out there but these are pioneer species…not dense, high-quality forages. In a few years, with a little help from the cows, we would have a nice, diverse stand of forages covering this field but by doing this work now we’ll have a diverse stand this year. And time is important to poor, hungry cows. We just skimmed the surface of the soil with the disk, in most cases going only an inch into the soil. 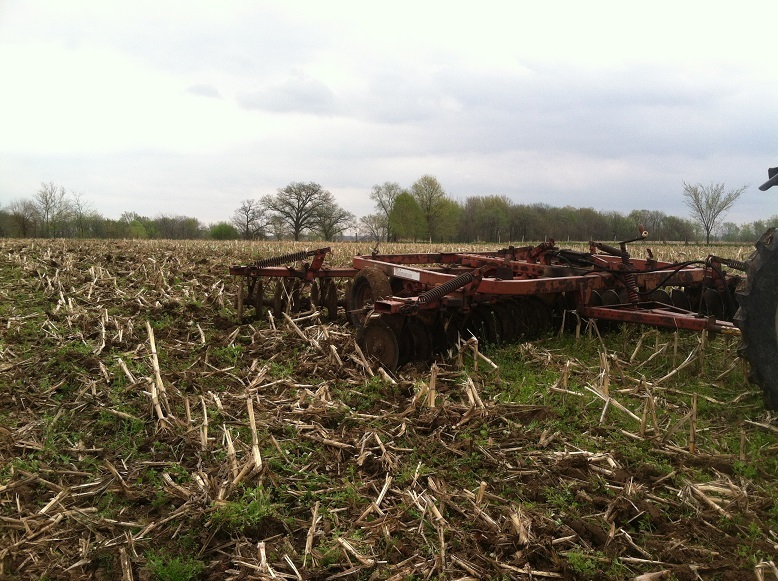 This allowed us to cut up the corn residue and expose additional soil, bringing seeds to the surface for quick germination. This also made a good bed for seeds of our own choosing. This was enough of a cut to expose a few worms and grubs but as I looked around I was pleasantly surprised by the good condition of the worms I was finding…what few worms there were. But there weren’t enough worms. At all. That will be another way we can measure our success at increasing soil health over time. 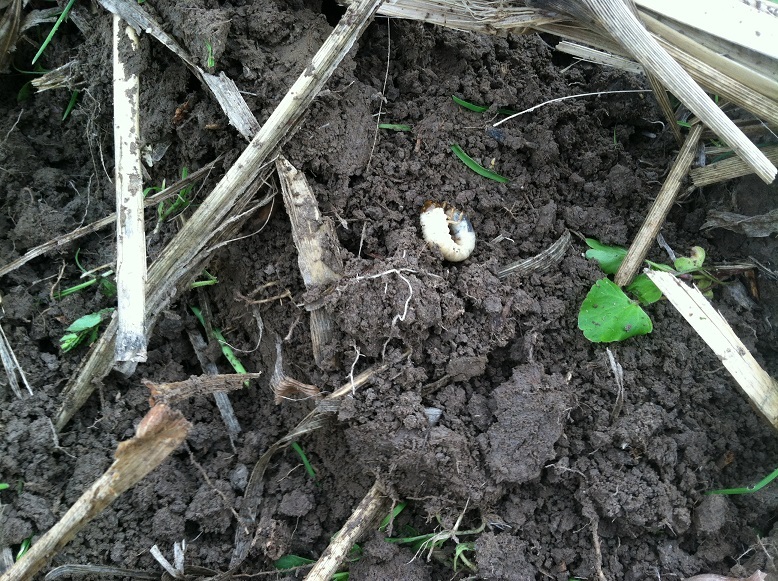 Healthy soil has lots of worms. This soil has very few. Few grubs too. 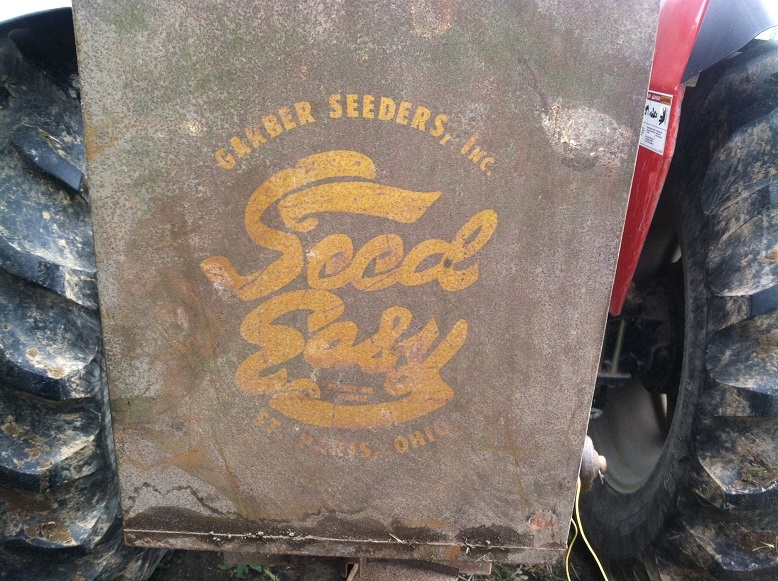 We broadcast a pasture mix of clovers, vernal alfalfa and a few grasses…but mostly clovers with the old seed spreader. The wind was blowing pretty hard so seeds scattered about a bit but the important work was done. The stalks are chopped, the soil is exposed to the coming rain and seeds are in place. It would have been nice if we could have used a drill but we didn’t happen to have a drill handy. We had an antique box with an electric motor to broadcast seeds. So, yes. I ripped soil on 9 acres. It would have been better, I think, to have planned ahead and asked my neighbor to do this for us while he was tilling his field next door for a small fee. But we didn’t do that. Better yet would have been to feed seedy hay to the cows over the whole field little by little over the winter but his cows were on the corn stubble all winter. So we didn’t do that. So now, on April 27, hours in advance of a week of monsoon season, we gently ripped and seeded the field. Maybe for the last time. The kids were along. I treasure moments like this, knowing it won’t last much longer. The kids working and playing nearby, helping when they can, wanting to be close. 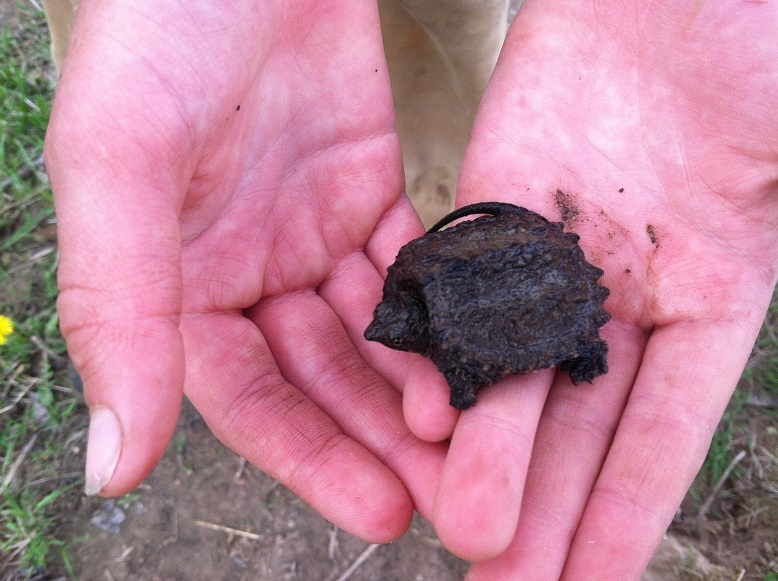 While we were helping grandpa keep the seeder filled the younger boy found a baby snapping turtle in the stream. It was about the size of a half-dollar. It’s not all work on the farm but it is full-time learning. Now to remove those pesky, unwanted interior fence lines. It’s really happening. Finally. The cows are on the move. We are covering ground at an almost unheard of pace…11 animals covering an acre each day divided into two sections. At first they grazed everything away from the repugnancy zones. Soon the grass got ahead of us and the cows could begin to graze very selectively. They go into each paddock fat and come out even more fat. And fat is what we are after. This is the time we have all been waiting for. The world is green again. The grass is growing fast. As much as I want to put some pressure on certain portions of the pasture this is not the time. It’s just time to run. Right now we are concerned about cow condition. I want the cows to have a big area, a big variety and a big volume of feed. But we are also concerned about future pasture. We don’t want the cows to eat the grass down to the dirt. There is not enough grass out there to knock it over and leave a covering on the soil so we just try to graze the tops off of the plants and move on immediately. 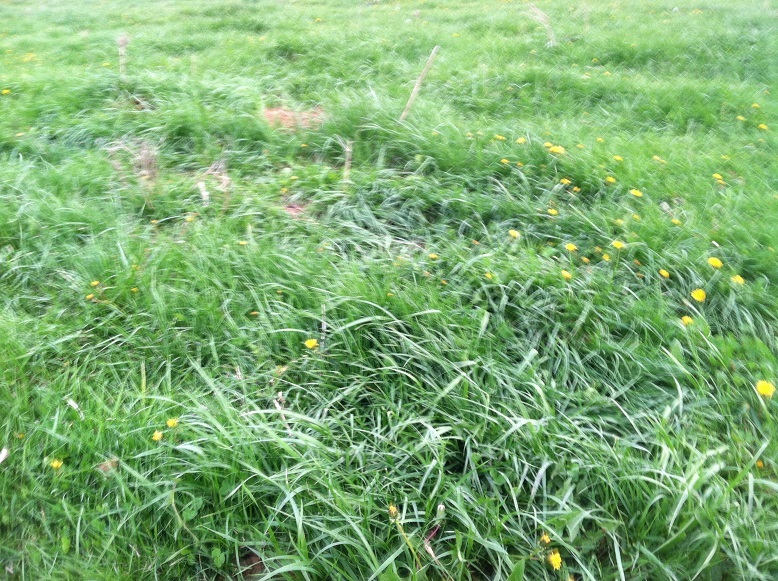 The pasture in the picture below was grazed over the course of a week about a week ago. The idea here is that we sprint across as much of the farm as we can. Realistically, I’ll only cover 2/3 of the farm before it begins to go to seed…at which point we’ll return to the first pasture. 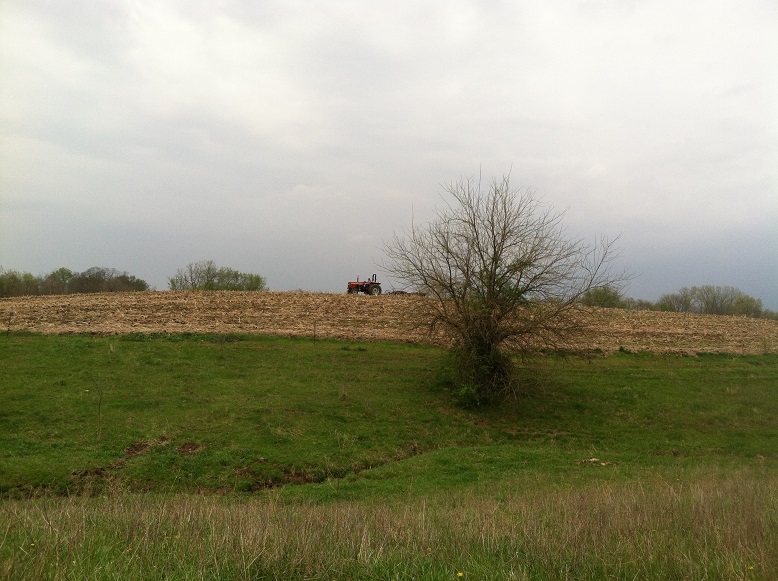 The ungrazed area will be left in reserve either for drought or for winter stockpile…or both. The starting point changes each year, the drought reserve changes each year, the pasture changes each year. It’s fun to plan and manage and as the forage quantity and quality increases I’ll have to increase the size of my herd. For instance, on the half of the farm we have managed for several years we have grazed once with cattle and once with chickens and the forage is at least 2 weeks ahead of the new 40. The goal is that the soil health will continue to improve and we’ll gain a month of grazing at each end of the season…then 6 weeks…then…well, then we will solve other problems. Keep in mind we just took possession of the 40 east of our house. We are building fence on pasture we have never walked before. Certainly we have seen the ground but fencing and grazing gives us more intimacy with the land than does a casual stroll. We have lots of places on the farm that are remote and rough…beyond zone 5. There is no reason to go there so we don’t. But with the cattle on rotation we are covering the whole farm. It’s amazing what we are finding. Everything from evil, thorny trees to the neighbor’s trash from decades ago. We do better some days than others. It’s hard to read the forage through the remaining weed stalks from last year. Sometimes the cows seem to fatten on nothing. Sometimes they look empty but there is standing forage all over behind them. I can only assume they are ignoring forage for a reason and it’s better to try to learn from their selectivity rather than to force the issue. Maybe I need to amend the soil there. Maybe the chickens need to sanitize the area. Maybe it just needs to rest. Sometimes we just open a fence and let the cows through. Sometimes we take the cows on a bit of a walk. Sunday morning we took a rather long walk. When the cows got there they went bananas running, rubbing on trees and playing around. 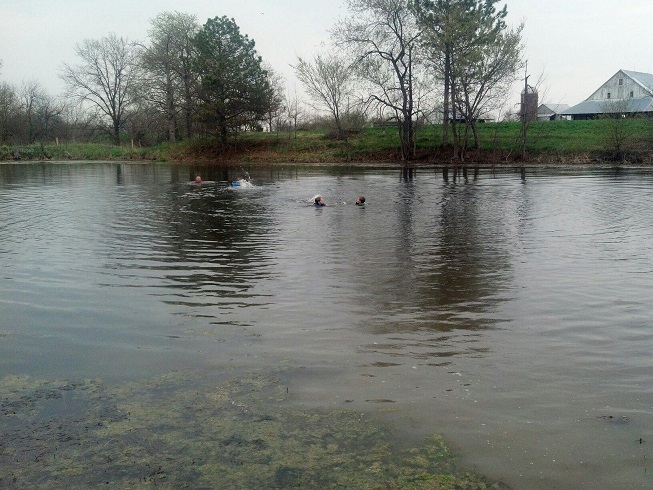 We didn’t realize until afternoon that they were probably looking for the missing steer…that we didn’t realize was missing. We walked them through a draw and he stayed behind to get a drink and a bite to eat. He was looking pretty lonely (but fat) when we found him later in the day. He flat refused to go over or under that horrible electric fence so we had to walk him all the way to the end of the line to rejoin the herd. I’m feeling pretty good about the new fence charger. 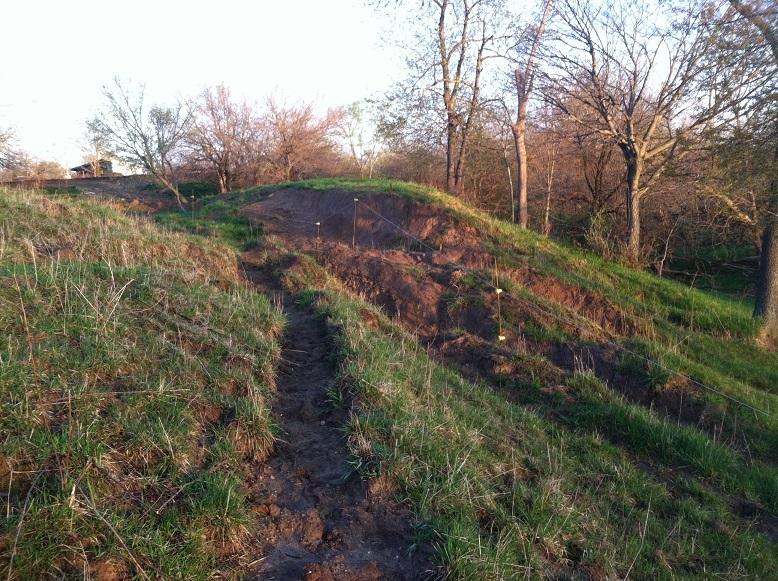 One thing I am constantly aware of is the poor condition of my south-facing slopes. 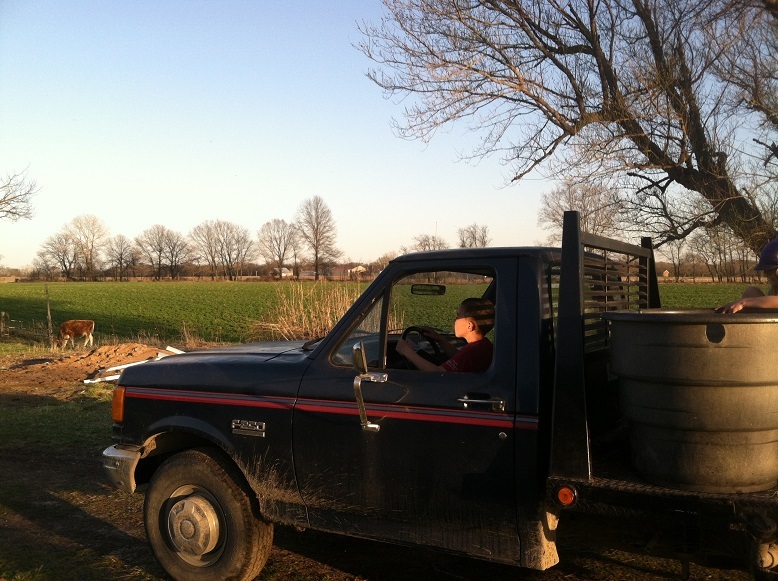 Our pastures have been set-stocked for decades. By grazing the hot south-facingn slopes in the middle of summer the grasses have been set back. The soil organic matter is low. I’ll have to hustle to correct this…and it will probably take several years. Matron talked about the same problem in a recent post. 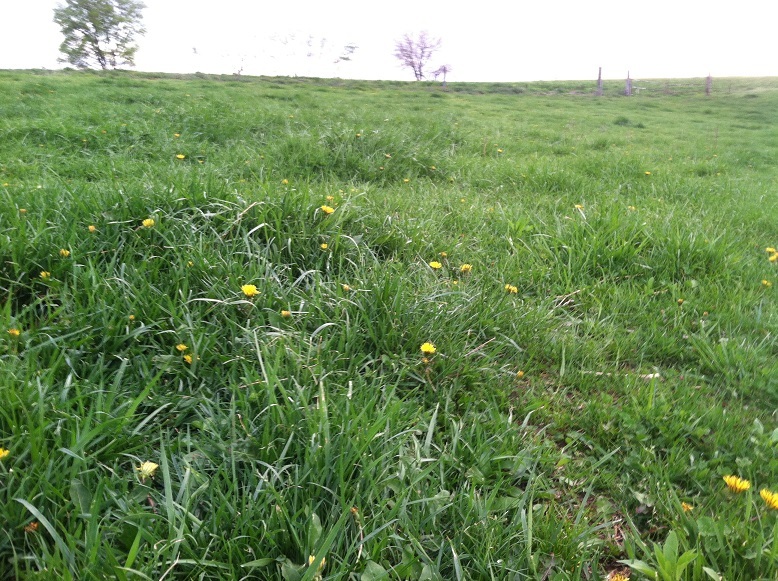 The main corrective action will be to use care when grazing the farm over the summer, preserving tall forage on these slopes to heal the grass. Tall grass catches more dew and puts down deep roots. I continue reading Henderson’s Farmer’s Progress in this post. I’ll quote him only as often as I need to. There is so much to this chapter I can only hit the high points and I have to stay within the vague bounds of fair use. Again, if you like what you see here, pull out all the stops. Go find yourself a copy of this book. In this chapter Mr. Henderson is giving practical advice on how to gain a foundation of knowledge and experience before taking on a farm of your own. The chapter starts with advice on making a good impression when applying to learn under an established farmer and detail on what to look for when evaluating the farmer for yourself…interviews go both ways. Does the farmer smoke? Is the farm in good repair? Will you be staying with the farmer or with the workers? You need to be in the middle of it to learn the business of farming, not staying with the workers and just learning the work. And you need to be both serious and respectful. In short, shut yer yapper other than to ask questions to clarify your role on the farm. You are here to learn both the business of farming and the practical work. A farm is very different from a school… A schoolmaster tends to become childish through constantly associating with children – every schoolboy is familiar with the feeble jokes at which he is expected to laugh, for example; but a farmer’s life is too hard for childishness, and he expects a sense of responsibility to be rapidly developed, as indeed it must, when you will soon be working with valuable animals and machinery. From here he devolves a little into a “back in my day” anecdote but I think he is right. School teachers will give you the same information over and over but a farmer expects you to remember after one telling. On the farm, lives and livelihoods depend on your memory. And you never know when you will need to recall that odd detail you were shown or told some time ago. …no matter what goes wrong the farm has to go on. If the farmer dies, if war is declared, or the buildings burned down, the cows still have to be milked, the poultry shut up to protect them from foxes, and the hundred and one routine jobs to go on day in and day out. We don’t get the luxury of sick days. We are constantly working to cross-train each other and the children to do every task on the farm…working to make sure everyone understands the cattle rotation, the pig chores, the chicken work. Handing off responsibility as the kids become old enough to handle it. Replacing our infrastructure with new equipment that more is easily portable so any age can move it. We are not often sick and when we are it is usually the kind of thing we can work through but I do get called away from the farm from time to time. The work continues with or without me. We spend a lot of time with our children reviewing our personal callings and our family vision. One child wants to be a baker. One wants to be an engineer. One wants to be a church pastor. One hopes to stay home and help us run the farm (we’ll help her run the farm instead). But the overall vision is that the farm is the center. It is home. When all else fails, when the villagers are marching with torches and pitchforks, when the chips are down the farm is a safe haven. If my children (even generations from now) are struggling with addiction, need a fresh start or even just a place to sit quietly and read or write a book…this is the place. Everything else we do from leading the lost to the Lord to building an award-winning, fantastic new geegaw to baking the best cake ever centers here. We produce. We make a positive contribution to our economy, our ecology, our community…we invest in human and intellectual capital, we raise up successive generations of inspired visionaries to carry on the tradition. And this is the place it all starts from. This is home. Even the cemetery is out back. That’s the vision. How often I have noticed that the best-tempered men are the best workers, that the busy people are the happy ones, because they are going somewhere. A man who is able to employ himself innocently and usefully is never miserable. It is an undoubted truth that the less one has to do the less time one has to do it in, and the less joy one finds in doing it. Those who have a great deal to do must buckle to, and usually make time in which to do it. People who have seen a lot of life will tell you that success is due less to ability, talent and opportunity than to zeal, concentration and perseverance. Those who achieve happiness through work do at least deserve it. Have you met me? I’m a very average person. Average height. Average build. Average (or below) looks. I got average grades. My folks are pretty normal folks…well, abnormal in that they stayed married and their children shared a common father. But otherwise, there is nothing special about us. Whatever I have I have because I worked for it. And worked my tail off. And it has been a lot of fun. I wrote recently about how tired we were after a day of processing chickens. Tired to the bone. I could list for you on one hand the number of places on my body that were not sore. The kids were tired and fussy. But during the actual work we were joking and playing around. Everybody was having fun. The weather was beautiful and the youngest kept asking “how many birds are left?” not so she could be done working but because we always do the chicken dance when the last chicken is in the kill cone. We have so much to do each morning before I can go to work. This morning my oldest and I knocked out all the chores in a record 13 minutes while Julie finished packing the egg orders for today. Are we happy? Well, it’s certainly hard work. And we somehow have time to get it all done. My worst days are always the days with little work to do. I very quickly go stir crazy. I don’t like to sit around. Somehow it is easier for me to do my reading while walking to and from a chore on the farm. It is easier for me to digest what I have read while trying to make a dead tree fall a certain direction or stack the hay wagon so it is all tied in and won’t fall off on a slope. Years ago dad ran a bulldozer with a broken foot. At the same time I ran a chainsaw with a broken wrist. It’s hard for us to just sit around. And no amount of sneezing or coughing can keep me in from the field. Funakoshi wrote that he worked through illness and fever by practicing karate forms until he sweated it out. I guess we do the same. I can sustain a high heart rate doing my farm chores. It doesn’t take long to break a sweat and cough out whatever needs to be coughed out. Seems better to me than shivering under a blanket watching old episodes of Newhart on TV (but I do enjoy watching Newhart). Back to the book, Mr. Henderson goes on to extol the virtues of sound nutrition and regular habits. We grow an ever-increasing portion of our food…food of a higher quality than we could find elsewhere. If you ever feel overtired it is probably due to error in diet rather than to hard work or long hours. Than fee the doctor for a nouseous draught. God never made his work, for man to mend. Remember what I wrote about checking livestock when a raging storm weakens? That, as Mr. Henderson points out, is one of the times you should remember that little poem. Or when checking the cows in an ice storm. He then goes on to talk about the importance of working efficiently. If you allot an hour of time to cleaning a stall but finish early, apply your extra time toward another, smaller task. The ultimate goal is to free up your schedule so you can spend more time observing your stock and the weather. 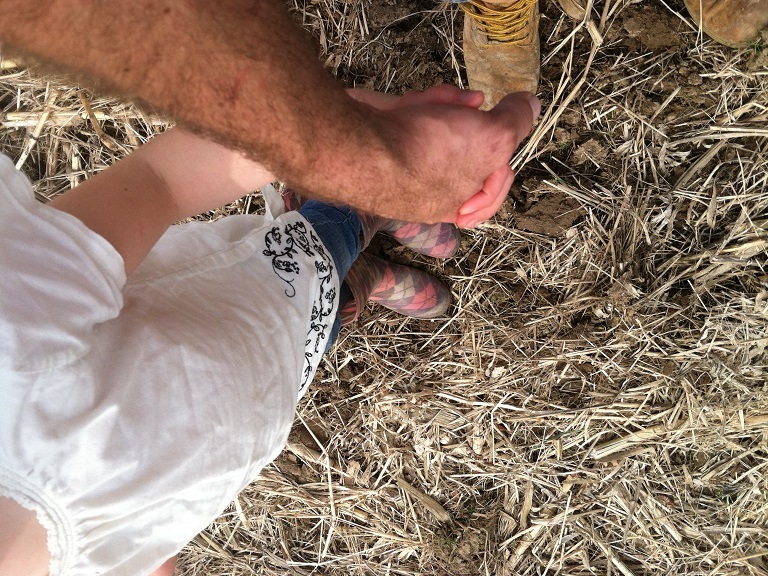 The rest of the chapter is focused on making yourself the best farm hand you can be as you turn yourself, slowly, into the best farmer you can be. I’m going to share a couple of quotes that affect me personally. Hundreds of workers have become farmers, but getting a little land, keeping a few pigs or poultry, and reinvesting the profits in more stock, while continuing to work for another. It may require a special effort to do this before and after a full day’s work elsewhere, but the knowledge and experience thus gained will better equip a man to be a farmer than a degree in agriculture, however well merited. …many who wish to enter the farming industry later in life….Their way is difficult indeed. If they bring capital, they often spend a lot in bitter experience, for lack of knowledge. Without capital they often find the way too hard, with their preconceived notions of farming and high standards of living. They often think they cannot afford to spend the time to learn the trade; for them there comes a rude awakening when it is too late. Well, every bit of that hurts. Difficult indeed. Bitter experience indeed. Lack of knowledge indeed. High standards of living…well, not so much. We are pretty content. Well, I say that but the money all gets spent somehow. I am, however, spending the time to learn the trade. I observe. I read. I discuss. I question. I share. Hopefully, the education I am paying for now is being absorbed by my children and will launch them into their own successes. But for all who would enter farming, and I know of no easy way, it is necessary to be sure in their own minds what they want to achieve, to be prepared to pay the price in time, labour and study to achieve it, and to be satisfied with it as their ultimate aim and goal. I have only brushed the high points of this chapter. I know this book is hard to find but I really think it is worth the effort involved. I left so much out of this chapter it is almost shameful. But that last sentence sums things up nicely. It ain’t easy. Work hard, study and find your satisfaction in the work. I used to work for a man named Norm who owned and ran a manufacturing plant in a nearby town. I asked Norm, in a personal conversation, what he liked to do for fun. He, being of few words, said, “I own a bass boat but have never used it.” I chewed on that statement for 10 years before I really understood what he said. Norm can do anything he wants to do with his time. He even has a bass boat. He chooses to make stuff out of metal for fun. After seeking success in life as a husband and a father, I want to look at my cows. I am willing to do whatever I have to do to make that happen. I don’t even need to own an unused bass boat. Where Did the Week Go? or Broiler Blues. Two Posts in One. Chickens? Sold or in the freezer. Pullet chicks? Safe in the brooder. So. Yeah. All the work got done but the night before we butchered birds Julie turns to me and says, “I feel like we are a little distant” or some such statement…apparently I wasn’t listening to her. Point taken. But the taxes got done on time. We lost so much money on the farm everything turned out OK. How about that? I really don’t remember much else of my week. I know Julie spent the early part of the week on the phone with the tax office and working on spreadsheets for hours on end. I took Thursday off of work to butcher the first 200 broilers. We wanted to have birds to customers in time for Easter weekend which proved to be a good choice. I have a lot to say about this spring’s batch of broilers but let’s start with butcher day. Then we’ll go back in time a little bit. Thursday started Wednesday night. The layers needed to go to fresh pasture before they began protesting. We also needed to pull the feeders out of the chicken tractors so the broilers digestive tracts would be clean for butcher day. Just like every night, we all come in the house hungry and tired around 8:15. Supper…brush teeth…bedtime. Julie wonders if we are losing our closeness. I don’t know. I haven’t noticed anything wrong. The plan was to start butchering at 8:00 sharp. My biological alarm clock wakes me up at 4:00. Time to make the donuts. I filled the scalder, washed up some equipment, sharpened knives and washed dishes. Julie stayed in bed. She later told me I left the bathroom light on as my way, in her words, of “giving a not-so-subtle hint that she needed to get up too”. Julie and I wanted to give the kids a treat for breakfast and, since we had a surplus of brown bananas, we decided on banana bread muffins. With the scalder warming, the dishes washed, the paper trash burned, the buckets ready, the knives sharp and breakfast and coffee delivered to my belly and muffins cooling on the counter it was time to go check the animals. Julie opened the nest boxes, I loaded up the crates on the trailer. The kids attended to other chores. Everybody met up again at the brooder. There was about a 30% chance the new layer pullets would arrive Thursday morning and I wasn’t ready. I spread out the remaining bedding, added fresh and got everything warm and ready. It is always better to give chicks warm water when they arrive so we like to have the water in place well in advance. 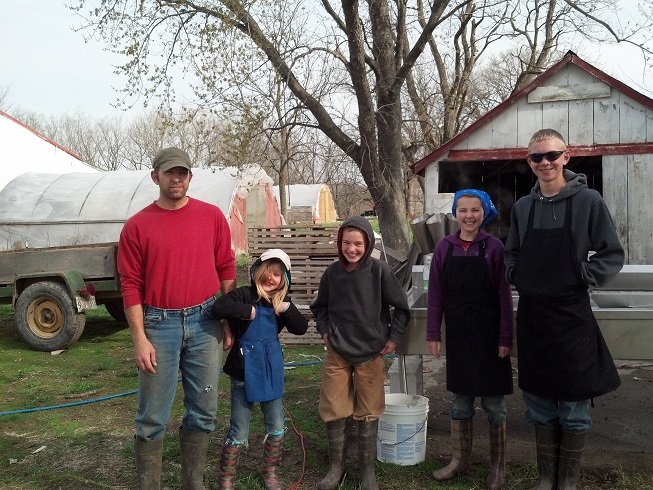 Then the kids and I went out to move the cows and catch the broilers. The youngest son rolled up the fencing to allow the cows access to fresh grazing. Pretty cool that a 9 year old can manage a herd of cattle. The rest of us crated up the first 50 birds and took them home. Julie had returned home to wash and sanitize the surfaces. It’s funny how time flies. We missed out 8:00 start time…by 90 minutes. But everybody had eaten a banana bread muffin, tied on their aprons and decided what job they were going to do today. I always kill/scald/pluck and remove the heads. Always. That is the worst and most demanding job. To cover all three jobs I have to move around a lot, lift and control flapping birds and spend the whole day covered in a delicious mixture of blood and chicken manure. The best is when the back end of a bird ejects liquid in your face like a squirt gun. So I do that job. The girls check the birds for feathers that were missed by the plucker (usually the tail feathers or under the wings) and the oldest girl removes the feet and slides the bird to the oldest boy. His job is to slice through the skin just above the breast then loosen the crop, esophagus and trachea. Then he delivers the birds to the shackles where Julie finishes the evisceration. The youngest boy then does final inspection, removes lungs, bits of liver and sprays the birds out before putting them in the first rinse water tank. That’s the first half of the process. I believe each bird gets about a minute of work from crate to chill tank. When packaging we see each bird for about another minute. Really, we just do a quick inspection, final feather check then pop each into a bag, clamp the bag shut and weigh, price and label the bird before escorting them to the freezer. It has to go fast and the whole process can be thrown out of whack by a bad scald. So that’s where we’re going to start. Longtime readers know I have a love/hate thing with my scalder. I have moved it inside, out of the wind. I have blocked a portion of the chimney to help it retain heat. I have removed the (broken) thermocouple and piped the burner directly to the propane tank giving me complete control over the flame. I have done everything I can think of to make it more efficient short of coating the outside of it with spray foam and it still can’t keep up with me. It just can’t. Either it needs two burners or I need two scalders. I’m going to suggest that the scalder is limited to about 50 birds/hour on a 60 degree day with no wind. I can work twice as fast as that so I end up frustrated when the volume of chickens passing through the scalder exceeds the scalder’s ability to generate and retain heat. It reaches a point where we just have to call a stop for 15 minutes or so. The solution may be to box up 50 birds at a time, run those birds through then cover the top of the scalder while going back to the field for more birds. This is totally on me. We lost a lot of birds. Normally we see a less than 5% death loss on birds from the time they exit the shipping box to the time they crate up on butcher day. One exception to this was an unexpected and cold rainstorm that came through 2 days after we moved chicks to chicken tractors a few years back. We lost a bunch of birds that night but this year we seemed to lose one or two every night totaling 15% of the crop. We put 300 chicks in the brooder and brought 296 out three and a half weeks later. 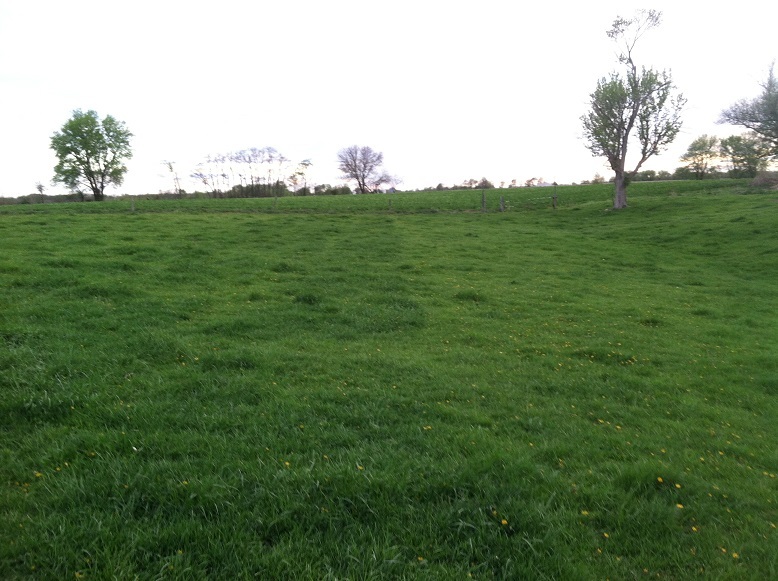 The first few weeks on pasture were fine…then the loses started mounting up. So here was the problem: I concentrated small birds into fewer chicken tractors. My tractors allow us to keep 50 grown broilers comfortably. When they are small, though, I prefer to keep them in larger groups. More manure, less work. That is a mistake. I need to split the birds up early. As soon as we got them back down to appropriate numbers we stopped finding dead birds. You really have to respect that 2 sq. ft. per bird ratio. A bird just needs room to get away. Our chicks arrive on or shortly after Valentines day. We do this so we can hit the market with birds early. Usually, in Illinois, the weather breaks just as the birds are ready for pasture. This year the pasture was a little behind the birds. That was hard on the birds and it was hard on the farmers. But if we delay by two weeks we will have to save birds from clouds of buffalo gnats at the end of April. Or we, ourselves, will be suffering from mouthfuls of gnats and itchy stings while butchering the birds. So we could delay even longer so the chicks are in the brooder when the gnats emerge. That means we aren’t on pasture until the middle of May and don’t butcher until July. July seems to be the beginning of the real, searing heat. July 4 is a popular time to BBQ chicken but after that, nobody wants to cook. We have carried full freezers through 107 degree days in July and August. No fun. So, when is the best time to raise birds? I think we’re doing the right thing getting chicks on Valentines day and hitting the early market. This year worked out very well making fresh birds available for Easter weekend. But we may push off a week or so next year to give the grass a little more time. It’s hard to get this stuff right. 60% of the birds should be sold before we even buy the chicks. It’s not hard to sell chicken. Not at all. But it is hard to sell 300 chickens one at a time. Not only do we need to continue following up with existing customers, we need to work to penetrate new markets and encourage buyers to stock up for the year. We do broilers spring and fall. How many birds do you need to make them stretch between batches? What can I do to convince you to use the whole bird so I don’t have to cut them up? Julie always tears a fingernail off when eviscerating. Always. She doesn’t enjoy the work. It makes her sore and tired and leads to days worth of discussions of the value of driving our chickens 4 hours each way to a processor and changing our license type. I can certainly see the merit of this idea but I think the better solution would be to make sure we have rubber gloves for her to wear or, better yet, rearrange things so I am doing the evisceration. Maybe our oldest can kill/scald/pluck and I can just take it from there. He may be slow enough for the scalder for a while. 200 is a lot of birds to do in a day. No matter how many birds we process we have to clean and sterilize all of our equipment before and after. That work takes about an hour total. 50 birds realistically take us about an hour (because of the scalder). Packaging 50 birds takes us about an hour. How many hours do we want to work in a day? It might be better for Julie to get everything ready to process 50 birds each night after I get home from work. She could clean and prep the work area, the kids can help catch the birds. With supper in a crock pot, we could start as soon as I get home and wrap up before bedtime. …because my wife is my favorite person. There is no other person I want to be with. For the rest of my life, better or worse, richer or poorer, sickness and health until death. She is with me when we do morning chores. We wash dishes, we wash and pack eggs, we move chicken tractors, check the brooder, move the cows, check the pigs then race home where she packs a breakfast and lunch for me. Soon we will include milking in our morning routine. We stick together…and do so very purposefully. But being together is, apparently, not the same is being close…emotionally. We talk. We hold hands. We kiss. But she feels that we are lacking some level of closeness that goes beyond just the chore list. I have to tell you, I have a hard time even understanding what she is talking about. Apparently, the thing to do is to just sit with her, maybe read the Bible together and …um…not…work. Talk. Just talk and listen. No agenda beyond letting it happen. Girls are so weird. But if that’s what she needs, well, she puts up with a lot from me. It seems like I have to relearn this lesson every so many months. It takes a lot of work for me to not work. I’ll have to work on that. I’m sure there are more lessons we can glean from this year’s spring broiler crop but that’s enough for today. If you have experiences managing family, marriage and business please share something in comments. Marriage and family are much more difficult than the brochure indicates. In my last post I wandered a bit. We are, in our home, big fans of books. George Henderson’s books are so in our wheelhouse I got a little excited and ran off on a wild tangent about my nomination of Henderson’s works into our informal list of agricultural classics. A list that includes Pastured Poultry Profits, Contrary Farmer, Grassfed Cattle, Comeback Farms, Our Farm of Four Acres and Harris on the Pig…and many others. In fact, look for a post or page on this topic soon. Henderson warns the reader against farmers who don’t read (kind of funny, that) and against writers who don’t farm…especially college professors who teach agriculture and have never farmed. And don’t forget legislators who have never farmed. I’ll let him tell you. Books are useful, they are sometimes our only contact with great minds, but make them your servants and not your masters. To many reading is a drug. This book is of no use whatever unless you put into practice something you learn from it. An hour spent in serious reading, each night, will give you all the scientific knowledge you require and is probably as much as the human brain can carry. How seldom do we see the college-trained man applying his knowledge! Every student is taught that liquid manure contains the most valuable plant foods, yet how many store and use it to the best advantage when they start farming? Probably not one in a hundred; yet ninety-nine out of a hundred French or German peasants make provision to return every drop to the land. Scientific knowledge has its value, but to go far in farming you must train your mind and body to be the servant of your will. All this book learnin’ is only a portion of the work required. There is also hands-on. And travel…time for observation. I have spent at least an hour a day for at least 10 years reading a wide variety of farming books and I feel like I am only just beginning. I have only lived on this farm for a little over four years and I can tell you, I’m still at the bottom of a big hill. But we are climbing. I am on what you might consider the self-study track to farming and I can tell you it is an expensive way to learn. But we are learning. Slowly. And we are investing that in our children. If things work out, one or more will take the reins from us soon and they’ll have a running start. With land that is ready, cows that are successful on grass, SOPs, training and experimentation out of the way, they’ll just focus intently on marketing product rather than paying for school. And I’ll just clean the toilets. But right now, it’s an expensive way to go. Henderson strongly emphasizes that farming should be learned from an efficient farmer…one who has his ducks in a row and is actively looking for help, not some guy who is kind and willing but has no idea what to do with you. Further, he strongly suggests that I, as a farming father, send my kids to other farms to learn and see how they do things. But, again, Henderson is quite precise about what kind of learning is going on. I said earlier, you must study the farmer. Find out to what he attributes his success, and also form your own judgement on this. Listen patiently to all he has to say, even if he often repeats himself, and most farmers do, and gather those pearls of wisdom which are handed on from generation to generation. Listen also to the farm workers. You will find they have three main topics of conversation – beer, women and the Boss. You need not pay much attention to the first two, that is usually dull repetition, but their constant criticisms of the management will bear careful study. I am quoting Mr. Henderson quite extensively here (maybe even beginning to talk like him (isn’t that lovely?)) and I want to be careful not to relieve you of the desire to buy the book…if you can find it. I also need to stay in the fuzzy bounds of fair use as I quote from his book. There is so much in the passages above that is applicable outside of farming I have to talk about it. My dad sometimes asks me how someone can learn to do what I do for a living. How does somebody get into my real profession…my day job? For those who haven’t met me, I’m sort of a programmer…except I’m not. I can write in modern programming languages and have an elementary understanding of OOP principles but that’s not what I do. Well-written applications are a good thing…and God bless. Success breeds success and at some point, that success becomes a big mess. My job is to bring order to chaos. I act as a kind of steward over data collected by applications making sure it is secure, recoverable and easy to look through. It sounds easy enough but it is sort of like solving abstract puzzles all day with no right answers…and no answer sheet…and no instructor…and you have to use ink. For clarity, if you think I can fix your computer you are mistaken. Julie likes to say that I work on computers the way the UPS guy works on a truck. So, please don’t invite me to a social event then corner me with tech questions. True story. I’m not a tech guy, I just play one on TV. If the anecdote below looks too long to bother with, know that I have been in front of a computer every day for 30 years (before the Google, before the age of AOL, beyond the birth of Microsoft Windows…since the days of the 5 1/4 floppy disk.) and have studied them in detail…with a very specific focus. Dad’s question is, “How did I learn to do this?” Well, dad, you bought a Commodore 64 when I was 8. Then you bought a 386 and I took a typing class. Then my sister married a computer genius who did some of the most amazing hacks I have ever seen…and did them 20 years ago (before Google). Then I started taking computers apart, upgrading memory, crashing Mack OS 8 (Windows blue-screened, Mac bombed), building PCs for friends, modifying PC boot menus to preserve upper memory (when memory was still $100/MB) and building networks so friends and I could all play Doom together. Having always been around them, constantly breaking and fixing things, I was very comfortable with the machines…that got me my first job. Networking experience and long hours of study got me my first Microsoft certification in the late ’90’s and launched me to a much better job. Hard work, dedication, long hours and evenings spent studying and working on extra, side projects not only got me the next job (in the current career) but actually made me pretty good at it. Beyond the hard work I have two experienced mentors who were very patient teachers and to this day tolerate and encourage me (Thanks Mike and Devi!). And I still have to spend spare time reading blogs and books, attending training, teaching training, talking to other professionals and listening to podcasts to stay afloat in my field. In short, it took me 30 years to learn how to do my job…and because tech is always changing the value of my knowledge is always eroding away. Look at the pattern above. There is all kinds of hands-on experience in my youth but that wasn’t enough. So I started reading everything I could put my hands on related to my career path. Then I sought out experienced mentors, kept reading and kept doing…inside and outside of my real job. Paid or not. I kept my head in the game. The thing I did was the thing I did. Compare that to my time as a fast food employee. I was there to get paid. When I was off-duty I wasn’t trying to get better at my job. I was skating with my friends. But before I break my arm patting myself on the back for my years of hard work and dedication, I should read more of Mr. Henderson. That man was an animal. Short of the fact that I have nearly 17 consecutive years of marriage to the same woman and four awesome children, he puts me to shame. Not only could he work me under the table, he was thoughtful and efficient about it. There is no virtue in getting up early unless you make good use of the time it puts at your disposal. How often you hear a farmer say that it is no use his getting up early because his men do not start until seven o’clock. One presumes he has to stop at 5 p.m. for the same reason. Yet is is before and after normal working hours that a farmer can often make the best use of his time; if it is only filling up tractors so that his men go out to work as soon as they arrive. If all the book-keeping, planning and organizing is done, then you can give your whole mind to the work in hand and enjoy a happy day on the land. On the subject of sleep, it is well to remember that it is the quality and not the quantity that matters. In some of the happiest years of my life I went to bed at 10 p.m. and got up at 3:30 a.m., seven days a week. Others may manage on less, but I found a tendency to lose weight if I cut my sleep down too far when working sixteen hours a day. One of the great secrets of success in farming is to train yourself to work long hours, with a high output, and without physical strain. I don’t know if I’m there with Mr. Henderson. In fact, this is further evidence of the gulf between us. I appreciate – even treasure – time spent sleeping. A nap on a Sunday afternoon. The alarm clock set for 5:11 so I can have that satisfied feeling of sleeping late…even though I’m usually looking at the alarm clock at 5:04. But you can’t take over the world if you’re asleep. You also can’t take over the world if you are eating junk food…it takes a lot of energy to stay active all day. And I find life is less satisfying when Julie is not right beside me…so I have to make time for her. And for the kids. So unlike Mr. Henderson, I include my family in my to-do list. Just the 6 of us…and the dog. We need time to chill. No books. No manure. No feed sacks, firewood or fence. No phone, no email, no text messages. Family takes work too. Long hours of reading aloud, playing board games, putting on puppet shows, teaching guitar, throwing the sport ball and just goofing around. That investment pays off later and with unpredictable results. With all of that going on I’m spread a little thin. Sometimes I wear through at the edges. I can’t imagine how Mr. Henderson did it – and wrote a book about it – but I hope you are enjoying reading him with me. He covered a lot of ground in one chapter. Let me know your thoughts in comments. Have you found a copy of this book yet? Nine and a half? Here are the keys. May seem crazy to give a kid control of a 3/4 ton go-kart but that’s how it works out here. Everybody needs to be trained from a young age to act responsibly and pitch in where needed. Sometimes an extra driver is just what the doctor ordered. He can’t pick up a bale of hay but he can learn to navigate the hay field so I can do a little less walking. He thought it was a pretty big deal. Just stay in the barnyard. You can’t go on the road for 7 more years. If you are just here for pretty pictures of cows, cats and pigs I’m afraid this isn’t the post for you. Well, maybe just one for clicks. On the other hand, if you are here to learn something cool, and if you haven’t yet, go to Amazon and order yourself a copy or three of The Farming Ladder. (Go ahead. Click the link. I live in The People’s Republic of Illinois so Amazon won’t pay me for linking to them.) 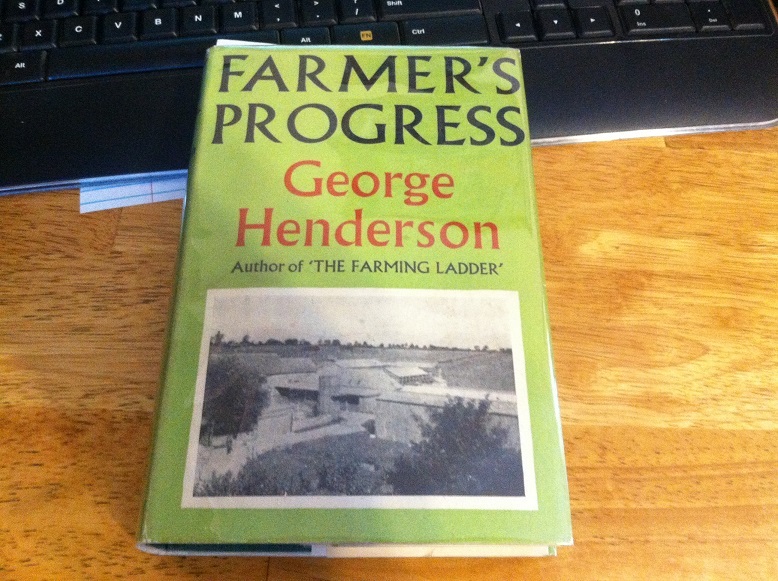 Odds are you’ll have a tough time finding a copy of the second book Henderson wrote, Farmer’s Progress. It is out of print and isn’t currently available anywhere unless you find a copy used somewhere (I currently see one for $63 and one for $80). I paid through the nose for my copy…and it was well worth it. I would like to share a little of it with you. Our country suffers sadly, and in many ways, from its amateur farmers, men who may have brought capital, but nothing else, into the industry. A whole mass of agricultural legislation could have been avoided by a simple Act requiring that a prospective tenant or occupier of an agricultural holding should bring proof that he had served his time, in service or apprenticeship, under an experienced and capable farmer. We take it that no man may hold command of a vessel carrying goods to and from our shores without a master’s ticket, which cannot be acquired in less than twelve years’ service at sea. Why, then, do we let loose any ex-hairdresser or haberdasher, who may have money to burn, on our priceless heritage, the soil? But take heart from this, there is an opportunity in every difficulty. They are often the people to follow in farming. One shrewd farmer, born on the farm where I now live, had one golden rule, ‘Always take over a farm from a gentleman farmer, always give up a farm to a gentleman farmer.’ He had twenty-two farms in his time, started with practically nothing and left over £40,000 in a time when that was a lot of money. You can often get in very cheaply when an amateur farmer is anxious to get out. You can sell out very well when the hobby farmer is keen to get in. It is such tips as this, scattered throughout the book, which give such excellent value for the modest sum my philanthropically-minded publishers charge for it! I’m not in favor of ongoing licensing from government agencies but he kind of makes a point. Then backs it up. Then goes on full attack against me personally from his vantage point 65 years ago. I have worked for and with a number of farmers but I’m a city kid and most of what I think I know I learned from reading books. Worse, I have a city job to support my farming hobby. (To be fair, Mr. Henderson repeatedly says a farmer should take advantage of every opportunity to make a little money. He wrote articles for travel magazines while on vacation. So maybe he wouldn’t be against me subsidizing my farm with off-farm income…in the early stages anyway.) If you saw this year’s taxes you would know that our farm is a losing venture…and we’re losing badly…primarily because we are making large infrastructure investments. How much more leisure time would I have if we had just stayed in the suburbs? But we weren’t happy there. And, though we work hard (and stay skinny), we are happy. The kids can run and explore and learn. 60 acres of playground. Houses, barns, livestock. Reproduction. Birth. Life. Death. Finance. Budgeting. Planning. No holds barred. No questions off-limits. …for throughout his life a farmer is always having to forgo his personal pleasures for the sake of his farm. If you are well suited to the life you will seldom miss them; for the enjoyment of living comes from having a purpose in life, and amusements and so-called pleasure are merely the means by which many people escape for a few hours from the fact that they have no aim or purpose in life. It is true that some farmers play golf, hunt and shoot, but it is very seldom done by men who have made their own way in the industry. They are too happy and absorved in their work – they live to farm, while the others farm to live. But even in farming you need not make a martyr of yourself. Work is sometimes to be enjoyed; and all around you are the wonders of nature, ready to make the world a perpetual source of interest and delight. He goes on to say that you, as a productive farmer, will notice things, learn things and invent things and will teach them and share them with others. You know, like with a blog. Though Adler may find the subject matter unimportant, the Farming Ladder and Farmer’s Progress are both worthy of the kind of study required by Adler…to really grok the author, to understand him…to wrestle with his ideas. They are certainly relevant to modern agriculture, they are certainly worth rereading. And if food isn’t a great idea, I don’t know what is. George Henderson has written a couple of real agricultural classics. I hope to discuss Farmer’s Progress as George and I wrestle it out. So far in Chapter 1 George has taken me to task. My real regret is that I didn’t read them sooner. Do yourself a favor. Go find copies of each and read them now. Do not pass GO. Do not collect $200…er £200. I’ll continue with chapter one in my next post. Mr. Henderson takes on agricultural colleges and it isn’t pretty.